The Acting Chairman, Economic and Financial Crime Commission (EFCC), Mr Ibrahim Magu on Monday paid a surprise visit to the newly appointed Chief Judge of Lagos State, Justice Opeyemi Oke. The News Agency of Nigeria (NAN) reports that the EFCC Chairman, who had a closed door meeting with Justice Oke for over an hour, arrived at the Lagos State High Court premises in Ikeja after the official working hours amid tight security. 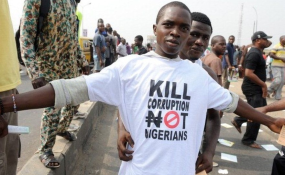 He told newsmen:"The fight against corruption will be more vigorous this year. "Everybody has a responsibility to play in the fight against corruption, l am here to mobilize you the journalists also. "It has been a tough one and we are going to increase the tempo of the fight against corruption this year. This time, we are fighting harder like never before. "We appreciate the role of the judiciary and if you notice the Lagos CJ and the Chief Justice of Nigeria are really working hard and they have put in so much efforts in fighting corruption with the help of other judges." Magu emphasised that the anti-graft war is a fight for every Nigerian and called on Nigerians and journalists to "key into the crusade". He said this became imperative in a bid to preserve a better future for Nigerians, especially the future generations. On the role expected of the media, Magu urged journalists to desist from collecting what he called "brown envelopes" and uphold the ethics of the profession. "They should help in working together with us at EFCC to fight the menace."